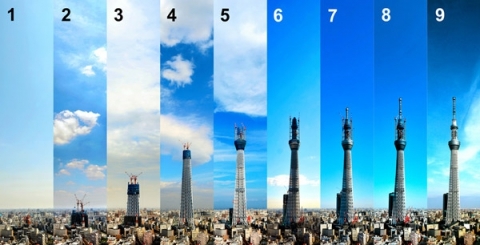 Skytree of Tokyo (東京スカイツリー), also known as the “tree of heaven” – is the latest Radio and TV Tower, which has become a shining symbol of Tokyo. The tower is located near the district of Asakusa. 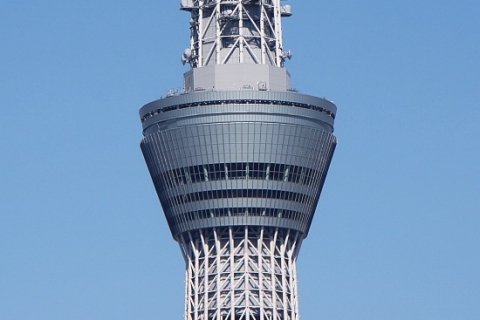 Its height – 634 meters * with the antenna, which is a world record. Thus, at the time of completion was Sky three second adjustment structure in the world and is the first building height in Japan. 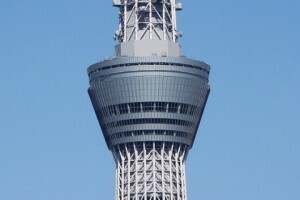 Sky Tree was built to replace the old Tokyo Tower, as its height is not enough for transmission of digital television to the upper floors of new skyscrapers, as well as in areas remote from the center of Tokyo. Construction of the tower was completed February 29, 2012, and was opened on 22 May. * In Japanese, the number “634” is read as “musashi” – this is the historical name of the region of Tokyo. At the base of the tower was built a large shopping complex and the aquarium, but tourists mainly attracted observation platforms “tree of heaven”, which offers stunning views of the city. The first site is located at an altitude of 350 meters, the second – 450 meters, which is also an absolute record. 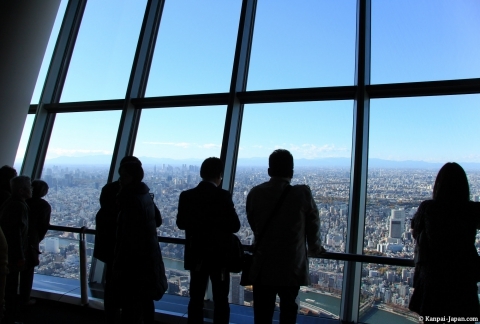 This is the highest viewing platform in Japan, and some of the best in the world. Tembo Deck – lower area, located at an altitude of 350 meters, has three floors. The fully glazed top floor offers a fantastic panoramic view of 360 degrees. On the second of three floors is a gift shop and restaurant Musashi Sky Restaurant, which serves French and Japanese fusion cuisine. On the ground floor there is a cafe area and a small area with a glass floor, through which you can see the base of the tower. At Tembo Deck level working elevators, with which you can climb to the second observation platform – 450-meter Tembo Gallery , which is a long, spiraling corridor that rises up. It offers an overview of the entire Kanto region. By the end of the corridor lift out to the site, similar to the lower Tembo Deck, with a few seating areas. 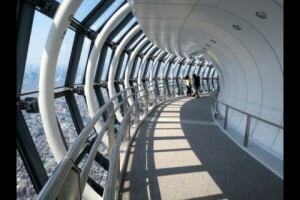 Here, at a height of 451.2 meters, finishes Tembo Gallery – Japan’s highest sightseeing platform. 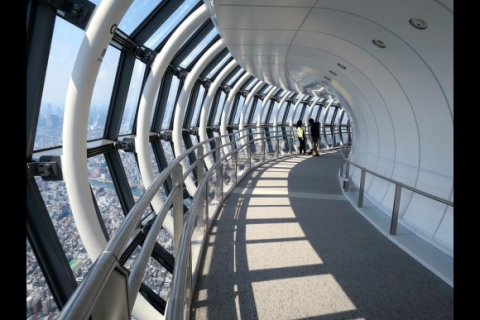 Buy a ticket to the first observation platform can be on the fourth floor of the tower, tickets for the 450-meter height to sell Tembo Deck level.Exit the tower is located on the fifth floor. From 8:00 to 22:00 (last admission 21:00). First ground: 2060 yen (normal ticket), 2,820 yen (speeding). 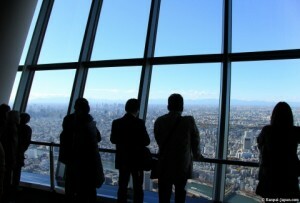 Second floor: in addition to the first area – 1030 yen. In the case of booking a certain time – additional 510 yen. 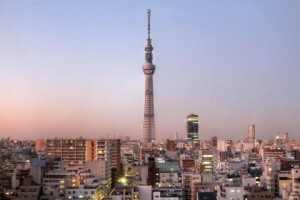 The nearest station – of Tokyo Skytree Station then (formerly known as Narihirabashi Station) on the Tobu Isesaki Line and station OshiageStation then on the lines of the metro Asakusa, Hanzomon and Keisei Oshiage. Or 20 minutes walk across the river from the Sumida Asakusa.